In LaGrange, Georgia, many low-income residents live in fear of losing their utilities due to unpaid court fines. Others are unable to get utility accounts at all because of their immigration status. All photos by the author. At an MLK Day celebration in LaGrange, Georgia, a few years ago, a man approached Ernest Ward, then-president of the Troup County NAACP, about his water bill. The man was upset, confused: He said he couldn’t afford the bill from the city because an old court fine he owed had been added on to it. That didn’t sound right to Ward, who wrote it off as impossibly bizarre. But over the years, the local NAACP kept hearing similar stories, until the organization eventually looked into it and discovered the policy is actually part of a city utility ordinance, and had been in place since at least the early 2000s. LaGrange takes unpaid fines from the municipal court—typically for small violations, such as driving with a suspended license or failure to register a pit bull—and tacks them onto utility bills, using the threat of losing water and electricity to try to get residents to pay. LaGrange owns and operates its own water, electric, and gas services, which generate a significant revenue surplus for the small city. In an unusual municipal funding arrangement, the city, which has no property taxes, uses this money to pay for other city services. The story of LaGrange reeks of the systemic racism in both Flint and Ferguson. Whether it’s framed as a criminal justice issue, a water justice issue, or both, the city’s poorest residents have been living in fear over unpaid fines for years, with many giving up entirely on leasing or owning a home because of their inability to pay, instead living with friends and family or moving to a different town. In 2017, the local and state NAACP joined Project South, the Southern Center for Human Rights, and seven individual residents of LaGrange to sue the city for discrimination under the Fair Housing Act. The story of LaGrange reeks of the systemic racism in both Flint and Ferguson. The lawsuit also included a complaint about LaGrange’s treatment of undocumented people, many of whom have been denied utility accounts entirely because the city requires a Social Security number. The plaintiffs’ attorneys found 90 percent of the residents subject to the court debt policy were Black (the city’s population is just 48 percent Black), and a 2016 report by the LaGrange Daily News found they largely lived in the segregated Black part of town. Ernest Ward is the former head of the Troup County NAACP in LaGrange, Georgia. Now, he's an activist speaking out against the city's court debt policy. It’s quiet in LaGrange in mid-winter, and in the early evening on the way into town, there are no sounds but the rushing highway, an hour south of Atlanta. The four-lane into town is lined with strip malls, then stands of pines, then strip malls again—a Hobby Lobby and a Home Depot glowing in the dusk. At night, you can see stars; this is west Georgia, a city of about 30,000 near the border with Alabama. Some people here commute to work for Duracell and Kia, which both have factories south of town. And there is old money, evidenced in downtown LaGrange’s luscious central square with a brand-new hotel next door. On the rich side of town, there are still lush estates that belonged to the Callaways, the city’s textile moguls of yore. Calvin Moreland is from LaGrange, born and raised, but now lives about a half hour away; he stopped off to meet me in the downtown Marriott lobby after his shift ended at Dollar General. Even as a lifelong LaGrange resident, the 37-year-old says he was surprised when he realized the city was adding his unpaid court fines to his water and electric bill. When he moved into a two-bedroom trailer alone, an old court fine from 2003 showed up; he was confused because he’d done jail time for the charge and didn’t realize he also still owed hundreds of dollars. He negotiated a payment plan with the city, but the bill was so expensive he couldn’t afford to pay his rent and utilities at the same time. “Some days I didn’t know how I was going to make it,” he said. His landlord ended up discounting his rent for a few months so he could catch up. He worked two jobs, Dollar General and Wendy’s, to pay off the fine, but shortly after that he left LaGrange for good to move in with family. He joined the court case with Project South to make a point about life in LaGrange. 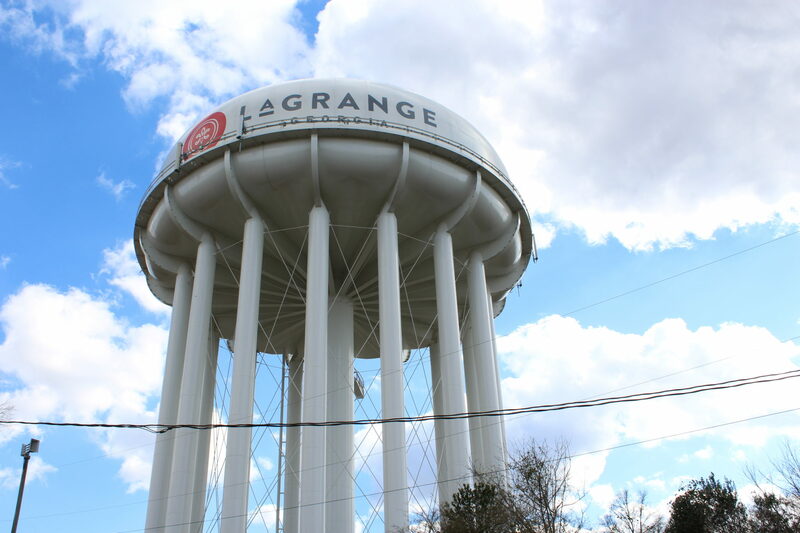 The City of LaGrange is unusual in that it doesn't have a property tax, relying almost entirely on water, electric, and trash service to raise revenue. Pamela Williams, whose mother is the landlord who gave a discount to Moreland, joined the lawsuit as well, alleging she’s lost thousands of dollars on discounting rent for tenants who owe fines and risk losing water and electric. Williams owns about ten properties in LaGrange, and she says she’s seen it at least 100 times before, mostly in the form of people asking her to put the utilities in her name. She’s also had tenants who’ve gone months without utilities before asking for help. LaGrange is known for running its utilities like a business—a municipal monopoly with a large profit margin. The city has no property tax, only a small sales tax (the most regressive form of tax revenue, meaning the burden falls most heavily on the people with the lowest incomes). The largest single source of revenue for the city is its utility services; the city charges enough for its water, gas, and electric services to run up a significant revenue surplus, and then shifts the cash from those accounts to its general fund to pay for police, street maintenance, and so on. “Is that unusual? Probably. But it’s not illegal or unethical,” said Michael Pagano, the dean of the College of Urban Planning and Public Affairs at University of Illinois at Chicago, who co-authored a study of municipal funding sources for the Brookings Institution. Many cities around the country have been struggling to find an effective revenue model as state governments and the federal government cut municipal funds. Depending on state law, cities can levy property, income, or sales tax, or they can depend on fines, fees, or charges for services. The Ferguson uprisings years ago put a spotlight on the injustice of funding municipalities through court fines, an approach that puts a disproportionate burden on low-income, Black residents. The lawyers for the plaintiffs in the lawsuit say denying people water and heat is an extreme form of injustice. The Fair Housing Act, they argue, was designed to protect from exactly this kind of discrimination—policies that have the effect of keeping people of color out of rental and ownership opportunities, regardless of the stated intent of the policy. And, they say, LaGrange punishes whole families for nonpayment on the part of just one family member. “The fear and the panic is palpable for people who are in danger of losing their power, losing their water, losing other utilities,” said Atteeyah Hollie, an attorney with the Southern Center for Human Rights. In December 2017, a federal judge in Georgia dismissed the lawsuit against the City of LaGrange. The plaintiffs appealed in the 11th Circuit Court of Appeals, which heard oral arguments this past December. The three-judge panel included one new judge appointed by the administration of President Donald Trump, Elizabeth Branch, whose conservative background makes it likely that she’ll try to stick to a close, and limited, reading of the Fair Housing Act. The Trump administration has been unusually quick in appointing new appeals court judges, which can have a huge effect in cases like that of LaGrange, where local policy often depends on federal intervention. Calvin Moreland worked extra shifts at Dollar General and Wendy's to pay off an old court fine that showed up on his water and electric bill. He's a plaintiff in the lawsuit against the city of LaGrange. “Nothing in this community that has enhanced our quality of life as citizens has come to us because it was the right thing to do. It always has taken litigation,”Ward said, citing the long history of federal intervention in segregation and discrimination cases. While Georgia public records law prohibits the release of individual utility account information, the utility rates alone suggest LaGrange’s system of funding itself through utilities disproportionately burdens low-income people. According to the city’s website, households generally pay higher average rates than commercial and industrial users, with low-income homes likely bearing a heavier burden relative to household income. It’s a highly effective system for LaGrange: The city’s 2019 budget estimates about $1 million in revenue from court fines and probation fees, and around $14 million in surplus from utility services to be transferred into the general fund. Of these revenues, strangely, the money collected through the court debts rolled over onto utility bills appears to be a tiny droplet: Over nearly three years ending in January 2019, Todd said the city collected just $40,419.70 in fines through that mechanism. While the benefit to the city is small, the burden for the city’s poor residents can be huge. Poor people in LaGrange live extremely precarious lives, and the city is tossing around their fates for a few dollars at a time in fines. A few days after my first trip to LaGrange, my phone blew up from an unknown number. “I need to talk to you. It’s very urgent. It’s very urgent,” said the woman in the message. I called her back, and she answered breathless. The woman, Alisha Dawson, had just moved to a new home in LaGrange, with her three-week-old baby and two small kids in tow, and she got my number from someone who said I could help. Her utility bill came with a fee on it that she had no idea about. She sent me a picture of the bill: A deposit, the utility charges for the month of December, and a mysterious fine of $571.97. The whole bill was for $1,033, a number she kept repeating as we talked, incredulous and panicked. The city had given her two-and-a-half weeks to pay in full or see her lights and water cut off. I couldn’t help, not really, but I let her know that we could at least file a public records request to find out the nature of the tacked-on fines, which appear on her bill with no explanation. I found no records for an Alisha Dawson in the municipal court; only an Alesha Dawson, which the court could not confirm was the same person. When I called her on January 23, Dawson said she’d gone into the utility office and cried; they gave her until February 1, and later February 23, to pay up. After that I stopped hearing back from her. I was struck both by her panic, and by the simple fact that she’d called me, a journalist in North Carolina, hoping I could help. It seemed there was no one she could turn to. While LaGrange attempts to collect court fines via utility accounts of its lowest-income residents, it also denies utilities entirely to another group: Undocumented immigrants. The city is among many municipalities across the South that require a Social Security number from residents applying for utilities. Countless immigrants in LaGrange have stories about the challenge of accessing water and electricity. One of the anonymous plaintiffs, named John Doe in the case, says he moved to the United States from Mexico with his wife and young son. They were living in a trailer park with lot of other Mexican immigrants, but when his wife got pregnant, they needed to move out to have more space. She also had a disease requiring regular dialysis and consistent water and electric service. In 2002 they tried to move, but after applying with the city, they found that they could not open up a utility account in their own name without a Social Security number (a tax ID, which he had because he pays U.S. taxes, was not sufficient). A close friend stepped in and put the account in his name. Reginald Mack outside the municipal court in LaGrange. Due to unpaid fines, he’s been unable to open a utility account in his own name in the city. That friend, Anton Flores-Maisonet, is the founder and executive director of Casa Alterna, a “hospitality house” in LaGrange devoted to supporting immigrants. He met John Doe through the church they both attended. Flores and his wife, Charlotte, live and run Casa Alterna in a small immigrant enclave in the middle of the wealthy, white side of town. He introduced me to his neighbor, Mattie Francis, who describes how Black domestic workers used to live here in concentrated poverty. When she was growing up, all the white families around them had running water and electricity; the Black area, which was called Goose Holler, went without utilities entirely. “It was rough living,” Francis recalled when we stopped by her house. Over time, some people in Goose Holler got indoor plumbing and electricity, but by the 1960s, the houses were demolished one by one. The last house remaining on the block was her uncle’s place, and unlike most Black families, her uncle owned his house. He didn’t want to leave and give the land to developers. Now, the block is lined with humble 1970s townhomes, little kids running around and bikes and toys spilling into the street. Many of the residents are from Central America, and many do the same domestic labor the Black residents did for white people in the area before they were pushed out two generations ago. And while they generally have running water and electricity, many depend on landlords and friends to open and maintain the accounts. This situation, Flores says, keeps them vulnerable, easy to control, overcharge, or displace. Immigrant rights lawyers, including Azadeh Shahshahani at Project South, have found many examples of cities denying utility accounts to people without Social Security numbers. In 2018, Project South sent letters to 19 local governments that had such a policy in place, citing legal concerns under the Privacy Act of 1974; nine of them have since agreed to change or end the policy. In its argument before the federal circuit court in December, the city said it has stopped requiring Social Security numbers for account applications. However, at the time of publication the city’s online application form still asked for that information. Todd wrote to me that the form is currently under review by city staff, and that 26 individuals have been issued accounts with no Social Security number since the change. Currently, residents can apply with just a government photo ID. But in Georgia, undocumented people generally can’t get driver’s licenses, so even without the Social Security requirement, many will continue to find it difficult to access a utility account in LaGrange. And anyone applying with no Social Security number is generally asked to pay the highest possible deposit, $500 to open an account. I wandered up to the municipal court on my last day in LaGrange, the place where the charges that end up on people’s water bills originate. The first person I talked to, shivering in the morning cold before the courtroom doors opened, nodded when I asked about the utility policy: He’d been through all of it before. Reginald Mack was picked up for driving without a license several times some years back, and ended up owing fines that he failed to pay during his probation. Years later, he said the fines showed up on his utility bill with the City of LaGrange, totaling almost $4,000. After a court official unlocked the doors, we passed through the metal detectors and into the courtroom separately. I’ve been in municipal courtrooms before, and it was familiar. The white judge before a silent group of Black residents, the parade of people charged with tiny “crimes”: driving without insurance, failure to yield, tying up a dog outside. Those who can pay a fine generally do so immediately; those who can’t are given probation and time to pay the fine. Probation comes with a cost of $35 per month. The people who come off probation still owing money are the ones who end up with utility charges. Reginald Mack told me on the way in that he wanted to plead not guilty to an open container charge (“the cop opened the beer for me, and then poured it out”). He had paid a $50 application fee for a public defender but never heard from one. Court started at 8:30 a.m., and the group listened, impassive, as the judge quickly explained everyone’s rights. People filled out the forms required to plead guilty and waive their right to an attorney and dropped them in a wire basket at the front of the room. Mack looked around for his public defender. At 9:01 a.m., while the judge was still going through the list of defendants, I saw Mack chat with the prosecutor for a few minutes, then get shuffled out to the hall. He never came back, and around 10:30 a.m., the judge called his name again. “Pretrial diversion,” the prosecutor mumbled, “it’s taken care of.” Mack left with a $150 fine to pay, but no new charge on his record. One last person, a young woman, took the stand to ask for two more weeks to pay $377 in fines from November for a traffic violation. If she doesn’t pay it, she could be unable to get water and electricity in LaGrange indefinitely. There were no trials, and the whole day ended like that, with a resigned quiet. Everyone walked back out into the cold sun.